I am trying to utilize my monitor's ability to switch video input and USB source (much like a KVM switch) with a USB hub. Previously I had all of the devices plugged directly into USB ports on the monitor. I could switch video input on the monitor to the Surface via its dock or the desktop (both machines are running Windows 10) and USB switched along with the video. Too many USB hubs are connected together. 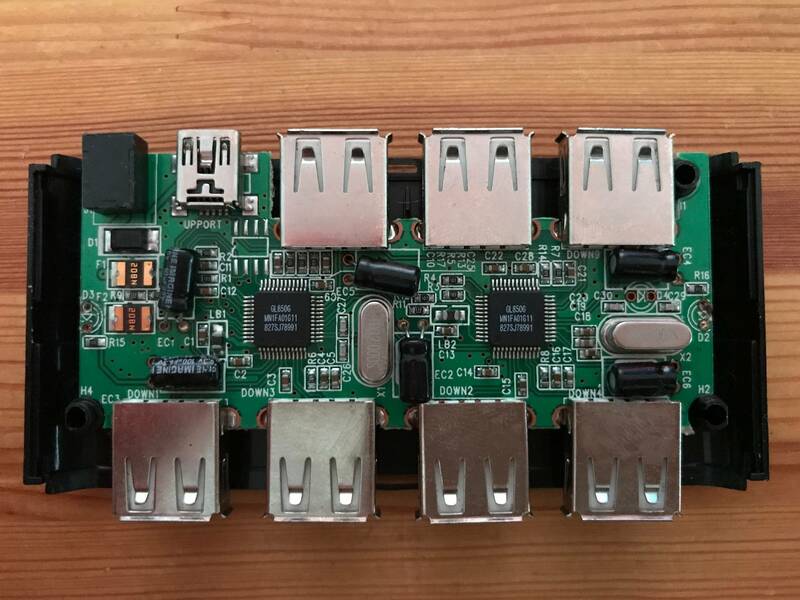 A USB hub will not function when it's connected more than 5 hubs away from the root port. Until this error I was under the impression that powered USB allowed for 127 devices to be daisy chained. Is this impression incorrect or is something wrong with my configuration? From this I definitely see that there are more than 5 hubs from the root port to the devices at the end. It seems that a "single layer" hub at the end would solve the issue. According to Ali Chen's comment "finding this information in marketing documents" would be unlikely. When counting hubs, you assume that every individual box/device has only one hub. This assumption is likely untrue. To begin, the 10-port "amazon hub" definitely has at least two hubs in chain, because single hubs are not manufactured with 10 ports, 7-port maximum [see this explanation]. Then the Dell monitor has also some special design - it has TWO UPSTREAM ports. What is its internal architecture, who knows. The "surface dock" is also a suspect for having more than one USB hub in the chain. And I don't know if the "surface" uses extra internal hub for whatever reason. 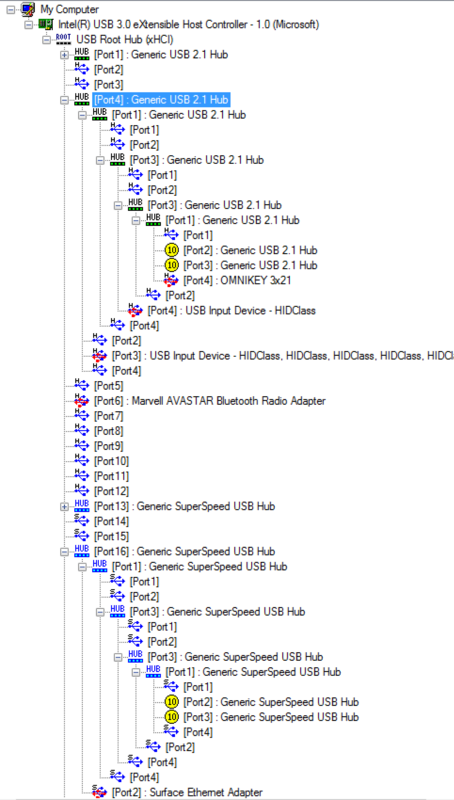 To get the actual idea how many hubs are there in the chain and what/how all things are connected, use USBTreeView.exe on the Surface side. I am sure the Surface got the chain right, and you do have more than 5 hubs in the chain. Addition: USB standard allows for 127 devices per one root controller, it doesn't mean that they are "daisy chained", just total of 127. 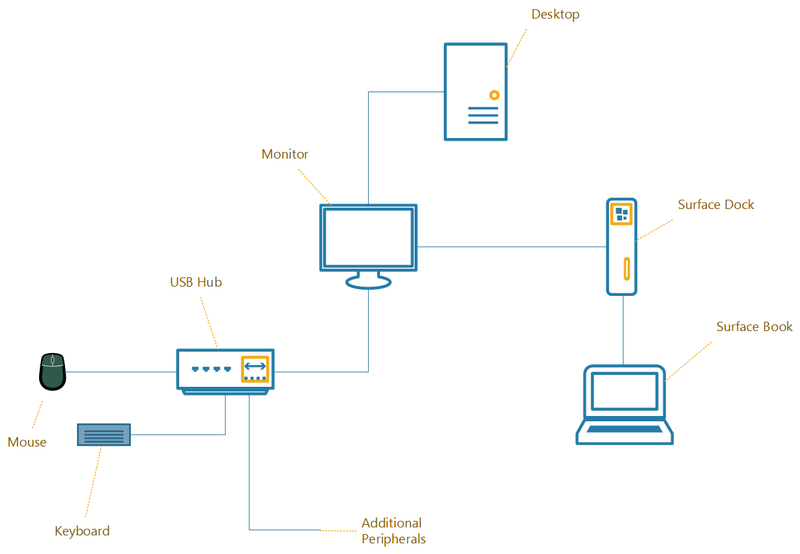 In fact, if we discount hubs as functional USB devices, the total number of useful devices comes down to 102, since you would need 17 7-port hubs to accommodate the devices, in three-tier configuration, and each hub will take one address out of available space. Your 10 port USB hub (and other devices) may actually contain multiple USB hubs in series internally. USB hubs are often built into equipment such as computers, keyboards, monitors, or printers. When such a device has many USB ports, they all usually stem from one or two internal USB hubs rather than each port having independent USB circuitry. As stated, the USB spec allows 127 devices to be connected through a single port. However, the USB spec only allows hubs five levels deep, or seven if including both the end device and the root device (the onboard controller itself). A newly attached hub will be assigned its unique address, and hubs may be cascaded up to five levels deep. 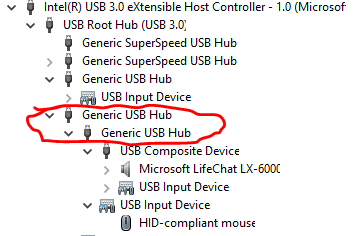 "Contains devices behind 5 levels of nested hubs – the maximum allowed"
The highlighted hubs belong to the Surface Dock, I verified it by connecting the mouse directly to one of the ports in the Surface Base. So at the very minimum you have 5 hubs. Probably the monitor has more than one hub, and that's why you are getting the error. Not the answer you're looking for? Browse other questions tagged usb kvm-switch microsoft-surface usb-hub or ask your own question. Maximum length of a USB Cable? How can I download and run the Windows version of USBView (the USB device viewer)? What is and how to increase the maximum number of usb devices? PC Switcher for USB Hubs? What is the performance penalty of chaining USB hubs? More than 5Gbps bandwidth reported from a USB3.0 / USB3.1 Gen 1 Root Hub, how is it possible? Can two USB 3.1 Gen-1 devices together saturate a USB 3.1 Gen-2 root hub? What could be wrong with my usb 3.0 chain?